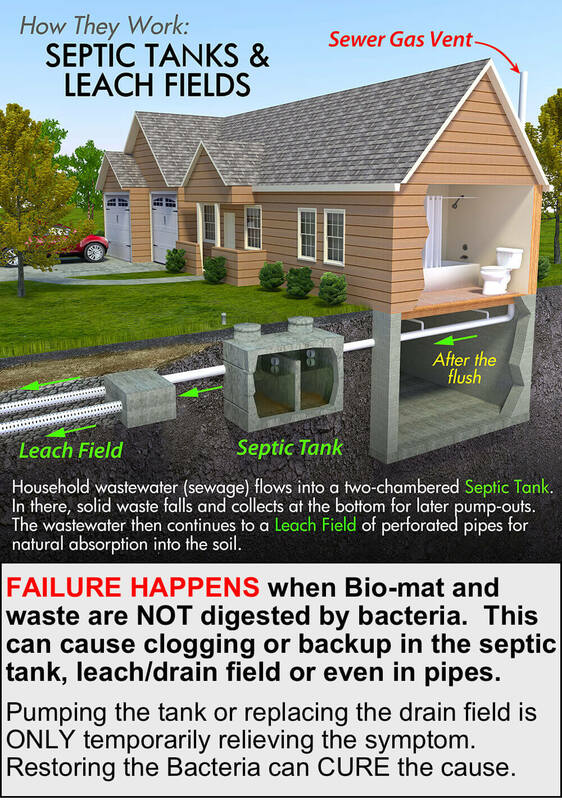 What Causes Septic System Failure? Regardless of the particular design of your septic system, each septic system contains a drainage area. Called drain fields, leach fields, weeping beds and even cesspools, these drainage portions of your system can become clogged from normal every day use. Your Septic System relies upon natural occurring bacteria in the septic tank to breakdown the solid waste and liquefy it. This is the entire basis upon which septic systems work. The Problem is that many household cleaners, bleaches and detergents are designed to kill germs and bacteria. So each time you do a load of laundry or clean the tub, large quantities of bacteria killing agents are deposited into your septic tank. Over time, this reduces your septic systems ability to liquefy the waste in the septic tank, and particles of solid waste, paper, greases and fats make their way to the drain field. As they come in contact with the soil, this waste is collected at the soil line where it remains. This ‘Bio Mat” as it is called, can significantly restrict the drainage of your system, leading to Back Ups, Flooding, Foul Odor and More. At this stage, MOST consumers mistakenly replace their drain field or pump their tank. That is NOT the long-term answer that benefits them the most. SeptiCleanse is a homeowners Alternative to expensive septic system repairs or replacement. AND, with maintenance, it is permanent. This Powerhouse Formula is designed to Digest and Liquify the Build up of Sludge, Bio Mat and Hard Pan that can restrict the Drainage of your Septic System. If you are finding that your Septic System has become sluggish, backs up, or has begun flooding the yard, then SeptiCleanse is the RIGHT solution, AND can save you THOUSANDS in comparison to repairs. Not all Bacteria Strains are created equally. While their function is obviously similar, the Developers at SeptiCleanse have specifically formulated a blend of Bacteria and Enzymes exclusively for the purpose of Septic System Restoration. This makes SeptiCleanse the Ideal Alternative to Septic System or Drain Field Replacement. Visit the Easy Guide to which Product you Need to Buy. SeptiCleanse has 2 Types of Treatments. 1. Shock Treatments - these powerful treatments are designed to be used on older homes or homes that are currently experiencing a sluggish or failing septic system. These Restorative treatments should be used by consumers who are concerned with the performance of the system or for those homeowners who have older systems and are looking to avoid the expense of replacing the drain field. 2. Maintenance Treatments - maintenance treatments are designed to maintain the proper levels of bacteria within your system to ensure there are no problems with the overall performance of your septic system. THE VAST MAJORITY of our customers do at least a light shock to their system before starting a maintenance plan. These treatments should be used by homeowners who have a septic system that is working but they want to take steps to keep it that way. Remember, all septic systems will have problems on a long enough time line. SeptiCleanse maintenance treatments can keep your system performing for years to come. SeptiCleanse Bacteria is significantly more powerful than the naturally occurring bacteria your system is currently relying upon. These strains of bacteria Multiply exponentially within hours of application. They are powerful enough to withstand and offset the damage caused by household cleansers, bleaches and anti bacterial soaps and detergents. Our GRANULAR formula Shocks and Treatments consistently Rescue the failing septic systems of our customers. Our granular formula can settle deep into your septic tank, providing bacterial support to your tank, drain field and yard, essentially guaranteeing long-term benefit regardless of household water consumption. Industrial grade microbes replicate exponentially within hours of introduction to your septic system - twice as fast as leading hardware store brands. Our bacteria strains are better able to resist things you flush or dispose of, like bleaches and household cleaners, maintaining their effectiveness throughout the year. (these are often the big killers of bacterial balance in many septic systems). Our easy to use, flushable application allows all homeowners, regardless of age, health, gender, etc. to effectively restore their septic system. SeptiCleanse is compatible with all septic systems, cesspools, drain fields and leach fields. No matter what type of system your home has SeptiCleanse is 100% guaranteed to restore flow and proper drainage, eliminate costly pump-outs and prevent odors. SeptiCleanse has established itself as a Worldwide Leader in the Septic Treatment Marketplace. Our formulas are second to none and in our opinion, are Superior to the Competition. Furthermore, the SeptiCleanse Guarantee stands behind the product completely. If you continue to you have septic system troubles after using the appropriate SeptiCleanse Treatment, SeptiCleanse will provide you all the additional treatment needed to get your system running Free of Charge. With a guarantee like that, you can feel confident SeptiCleanse is the Right Choice for You. It can be the most confusing process of rescuing your septic system... figuring out which product or offer is the BEST one for you. Well don't worry... we have an easy-to-understand chart that will guide you to the right choice the first time. © 2019 Septicleanse Septic Tank Maintenance Products. SeptiCleanse products are backed by our 100% satisfaction guarantee! If you are not completely satisfied by how well our products have maintained and restored your septic system, you simply contact us and let us know. Then, We will IMMEDIATELY issue you 100% credit to use on any SeptiCleanse products. So, if you are not happy, you just let us know, and we will send you ANOTHER supply of your order, absolutely free. That’s right… this 100% satisfaction guarantee is as simple as that. Septicleanse stands behind our product 100% and is here to support you, and to ensure that your septic system is restored completely...no matter if we have to give you DOUBLE the product for free, to get the job done. With this rock-solid guarantee, Septicleanse makes sure that every client ends up happy, with a crystal clear septic or drainage system. Let's be honest, no one likes to pay for shipping. That's why Septicleanse is proud to guarantee free shipping on all orders over $150 no matter where you are located. Even international orders over $150 ship for free, and we hope with this great offer that ALL of our customers will be able to keep their septic systems running smoothly.